Angers: This château is immense in size and probably the best preserved military fortress in the Loire valley with 17 imposing towers made out of dark stone. It is home to the Apocalypse Tapestry, which is 100 metres long and depicts the Apocalypse as described in the Bible in the Book of Revelations. Baugé: It was built in the 15th century in the pre-Renaissance style, at the end of the "flamboyant Gothic" period and the façade combines elegance and simplicity. There is also a beautiful 17th century French apothecary with more than 650 items on display. In the Hôtel-Dieu, you can find out how the sick were cared for throughout the centuries. Brézé: It is a sixteenth century chateau rich in history and with underground chambers and tunnels, the only underground castle of the Loire Valley with some of the deepest ditches surrounding a château in Europe. 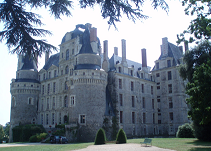 Brissac: It is the tallest chateau in France and one of the few châteaux which still remains as a family home, set in beautiful grounds. A castle has stood here since the 11th century, but the current building dates back to the 15th century. The facade reflects the renaissance and baroque architecture and it has more than 200 rooms, including the beautifully furnished Grand Gallery and bedrooms with authentic period furnishings. Chinon: This fairy-tale château prior to the 16th century was the preferred residence of Henry II (English Plantagenet king), and his wife Eleanor of Aquitaine and was where their son, Richard the Lionheart was born. 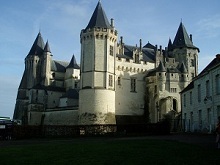 It arguably has the longest history of any Loire Valley castle, dating back to the 5th century. Langeais: It was founded in 992, but destroyed during the Hundred Years&apos; War. King Louis XI rebuilt it in the 15th century. Having been restored in the late 19th century, it is now one of the best examples of late medieval architecture, noted for its large, highly decorated chimney pieces. Lorie: This château was built in the 17th century and enlarged in the 18th century to include a stud farm. It has a large beautifully furnished marble lounge and its magnificent gardens open onto a private racetrack. Montreuil-Bellay: It dominates the town with some great views overlooking the River Thouet. The earliest fortifications date back to the 11th century and the current château came later in the 15th century. It has a medieval kitchen with a perfectly preserved chimney and you can walk through the gardens down to the river. Montgeoffroy: This small château is unusual in that the same family, who live there now, have owned the chateau since the 17th century. The perfectly preserved 18th century château with original furniture was built on the site of a 16th century château, incorporating the chapel and the two round towers which remained. Montsoreau: This is the only château to be built with its &apos;feet in the water&apos;, overlooking the confluence of the Rivers Loire and Vienne. 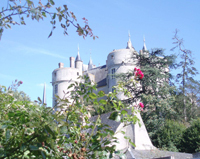 Le Château de la Dame stands proudly on the edge of the Loire River and has been lovingly renovated, with a child-friendly museum. Oiron: This dates back to the 15th century and is the background for Charles Perrault&apos;s fairy-tale, Puss in Boots. It was later extended over the centuries, until its decline at the end of the 18th century after which it lay abandoned. Just before World War II it was converted into a museum dedicated to contemporary art. Saumur: This was originally constructed as a fortified stronghold in the 10th century and substantially rebuilt by King Henry II a century later. More fortifications were added in the 16th century. It now houses several museums, including a Museum of Decorative Arts, the Museum of the Horse and a Museum of Toys. Serrant: This château was built over three centuries of the local dark schist and white tufa. It has a huge collection of antique furniture and beautiful cellars that have been redesigned as kitchens and medieval halls.